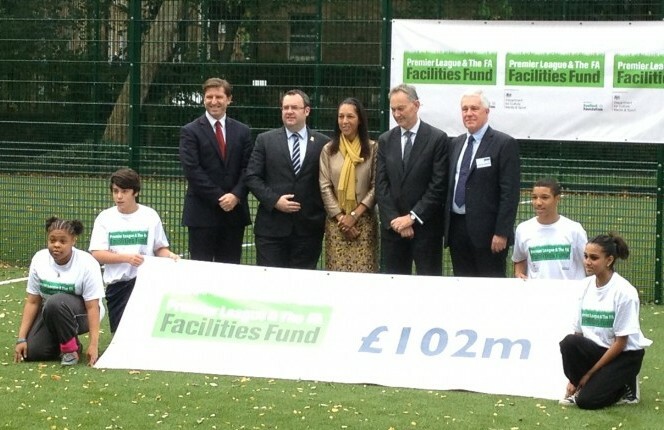 On Wednesday 23rd October, the Minister for Sport, Helen Grant MP, launched the new Premier League/FA Facilities Fund at the Colombo Centre football pitches. This £102m commitment to grassroots football is targeted at areas of high deprivation and aims to improve community sports facilities across the country. The Minister was joined by, amongst others, the Premier League Chief Executive, Richard Scudamore, and the FA General Secretary, Alex Horne, who emphasised the importance of providing high quality football pitches to both increase participation and improve skills at the highest level. The Colombo Centre 3G artifical pitches were recently refurbished thanks to grants from the Football Foundation and Mayor of London, as well as an interest-free loan from sports charity, Jubilee Hall Trust (JHT) and support from Coin Street Centre Trust. ‘We have been successfully managing the Colombo Centre since 2000, providing affordable sports and fitness activities for thousands of local people. The pitches were originally opened in 2004 and are used by 250 local school schildren every week, whilst our hugely popular leagues run every weekday to help subsidise free community access between 7.30-9.30pm Monday to Friday and all day at weekends.